A client of mine has moved to a different country 9 months ago. She had been head hunted by one of the government agencies in a fast-developing country in the Middle East. She is a very clever and competent lady with excellent professional skills. She has spent her last 25 years in her area of expertise as a leading consultant. When the opportunity arrived, she took it with a great enthusiasm. It was an opportunity of life time as she was going to be able to make a huge contribution in setting up and implementing the strategy for that country to be the number one in the world in her area of expertise. Although she was very enthusiastic she was not blinded by the opportunity and financial benefits that came with it. She was aware there were cultural differences and although she has been at the top of her profession, she has never worked abroad. Therefore, she reached out to me and asked me to coach her in her first three months of this cross-cultural journey. The first few weeks, she was happy. More than happy, I think, she was excited and enthusiastic. She had every reason to be. The weather was great and sunny, the culture was new and exotic, food was excellent. She was meeting new people from all over the world and everyone at work were very friendly. I call this honeymoon phase. This is the phase where people live in the clouds and think all is great. She was even thinking to cut our agreement short as she did not think she needed any support in adapting herself to this new environment. Four weeks into her new life, she emailed me and she asked for a session immediately. After few emails we managed to find some time in our diaries and we had an “unplanned” session. She was visibly in distress, shaking her legs, biting her lips, talking about an upset stomach etc. She talked about things being difficult at work such as people not listening to what she suggests or asking her to proof read their documents rather than working on the strategy as her job description and contract required. She was having difficulty in understanding all these things happening around her and she was literally shocked. Her employer also told her that they are making some amendments to her contract and none of them was for her benefit. This was totally against her professional understanding, her culture where business ethics were different. The result was headaches, anger, resentment, homesickness and sleepless nights. She was feeling like nothing but a failure. Suddenly that wonderful country she moved to 4 weeks ago turned out to be a giant prison for her, in her mind! She did not believe anything would be resolved and all she could think of was to go back to the UK. All she was saying was : Get me out of this place! I must admit that she had made some mistakes before arriving in the country such as signing the employment contract of another country without consulting a lawyer or someone who can help. But put this and a few other things aside, that once clever and self- assured woman was crumbling in front of my eyes. This was an important stage for her and for our coaching sessions. I call this stage shock phase. It is in this stage some people give up and decide to go back to their home countries. It is in this stage people experience the most change in their lives. They suddenly realize it is not a holiday anymore! It is for real! It is in this stage people realize their life is changing for good and change itself is scary. To get over all the fear of change, I often refer to the Kubler-Ross Change Curve with my clients. 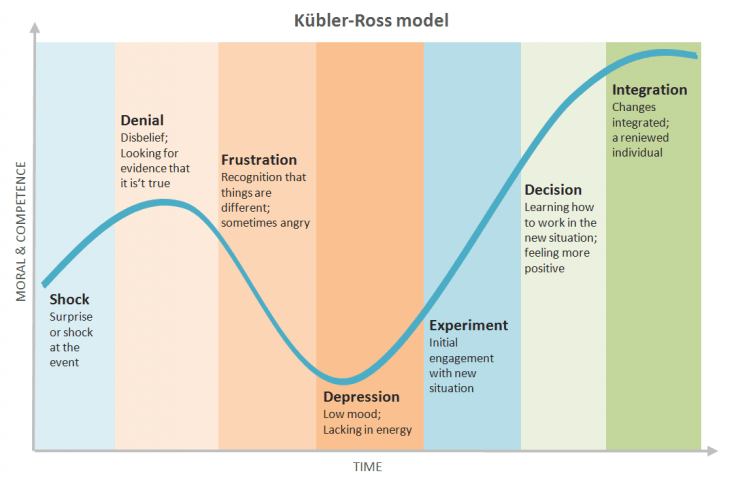 The Kubler-Ross Change Curve, which is also known as the 5 stages of change, is a model consisting of the various levels or stages of emotions which are experienced by a person who is soon going to approach change or is going through change. The 5 stages included in this model are denial, anger, bargaining, depression and acceptance. When my client called me, and insisted to have a session, she was at the anger stage. Throughout our sessions, we worked through the stages and she finally reached the point where she found herself happily living in her new life and contributing to the strategy of that government office as she had promised to do. She made new friends, joined some social groups and learned more about the local culture. This is the cultural adaptation phase. So, should you be planning to move abroad, work abroad or should you be managing a multicultural workforce, it will always be advisable to get some cross-cultural coaching. A simple hint: make sure the offer you have received from abroad is reviewed by a cross-cultural expert!! Newer PostFuture of Employment: It is time for HR to step in?